Tradescantia sillamontana growing herbaceous of the genus Tradescantia also known as Spiderwort, Tradescantia sillamontana perennial evergreen or annual in colder climate used as ornamental plant, can grow in mediterranean, desert, subtropics, temperate or tropics climate and growing in hardiness zone 9+ as perennial and hardiness zone 3+ as annual plant. Leaves color green, leaves hairy in oval shape with pointed top. Flower color pink, triangle shape flower that assembled by 3 triangle petals. 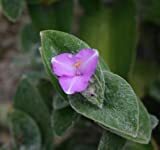 Tradescantia sillamontana is a perennial evergreen herbaceous plant . Lot of Wandering Jew Tradescantia - Many Varieties Types - Instant Collection!